Read more from Nia A. The morning afte r the United Nations IPCC (Intergovernmental Panel on Climate Change) dropped its “Global Warming of 1.5°C” report I felt almost every emotion available: angry, scared, frustrated, heartbroken, distraught. The report calls for “rapid, far reaching, and unprecedented systems change” in order to maintain a global temperature rise of no more than 1.5°C in the Anthropocene — the era of human-caused climate change. 1.5° global temperature increase is key because the catastrophes the world would experience between 1.5° and 2° are stark. Coral reefs would almost entirely disappear with 2° of warming, with just 10–30% of existing reefs surviving at 1.5°C. Our behavior, from the industrial revolution to the present, is projected to produce a more than 3°C increase. In order to sculpt out the solutions that this scientific body is calling for, we need an accurate analysis of the problem. I am certain that the root cause for the climate crisis is this system of white supremacist capitalism that we as a global society have been deceived, manipulated, and forced to engage in. White supremacy institutionalizes a racial hierarchy with whiteness at the top and blackness at the bottom. This ideology is intimately connected to capitalism because colonization — the genocide of indigenous peoples for their land and the enslavement of African peoples for their labor — was a project fueled by white supremacy and helped established this socio-economic system. This white supremacist capitalist colonial project is a far-reaching and interlocking machine of oppression and exploitation, that functions off our existence. Exploitation of a resource, be that people, water, land, non-human animals, etc., is essential to create profit. The clearest, most all-encompassing symptom of such a system is global warming and climate change. About a week ago I woke up to the state of California experiencing record breaking fires — thousands evacuated and up to 77 deceased. These fires’ intensity and rate is connected to climate change because less rain and faster spring snowmelt means a longer dry period. Incarcerated folks — including youth — are being paid a dollar an hour to fight these deadly wildfires. Meanwhile, Kim Kardashian and Kanye West paid private firefighters to save their Calabasas home. This is our socio – economic system working in perfect order, where the realities of climate change impact all, but whether or not your community survives is predetermined. In the 1980s American corporations pursued the extraction of fossil fuels despite having scientific evidence it would create a warming planet. This choice (profit for a select few vs. a habitable planet for all) is one governments and corporations continue to make. So I ask, why would a system that chooses profit over land and people, historically and presently, care about either in the future? My analysis: It won’t. We are literally living in a geological era no other human being has existed in and our collective thinking needs to catch up. The IPCC reported that we have 12 years to change our systems on a mass level or face global catastrophe — meaning we can no longer afford to depend on bureaucratic oligarchies (like our voting system, congress, etc.) for solutions because their rate of change does not hold against a 12 year time constraint. We cannot depend on market changes because this “market system” literally produced our reality. And we cannot silo our efforts because our bodies are implicated on all fronts. We can, however, make moves within the current structure and understand that it is all a tool for survival pending revolution (Thank you Black Panther Party). We can organize on local levels for autonomous spaces and root our efforts in cooperation and community accountability. We can use community-based economic systems like giving circles and land trusts to access and transform land. And we can communicate across justice movements and coordinate our efforts. For knowing and accepting the reality in which we exist, we can commit to radical practices (radical meaning addressing the problem at the root) and create new pathways for change. And while holding these truths is depressing, I’ve recently embraced that without destruction, creation is impossible. So maybe, global warming is the destruction of this extractive socio-economic system we need. Maybe rising up to the challenge of climate change by consciously combating white supremacy capitalism is how we, as a global society, can create ways of living that honor equity and sustainability between all entities on this planet. Maybe this destruction actually provides the ultimate opportunity for collective liberation. I’m not sure if I really believe in such a hopeful conclusion but I am sure that, as Angela Davis said, the job of all justice seeking people is to create “new terrains for struggle.” So while I’m still angry, scared, frustrated, heartbroken, and distraught, I’m also grateful for this clear understanding of the problem and the opportunity to engage in the radical imagining and implementation of a new and better world. Stay tuned for my next blog post exploring what it means to have this framework, be a blossoming 25 year old “professional”, and trying out public policy as a tool. 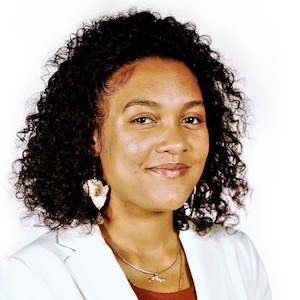 Nia Mitchell is Greenlining’s Environmental Equity Fellow. Follow her on Twitter.